Fun for the whole family, wearing 3-D glasses, guests shrink to the size of a toy, and ride on vehicles that travel and twist along a colorful midway-themed route. Upon arriving at each game booth, they will aim for animated targets using their own special on board toy cannon. 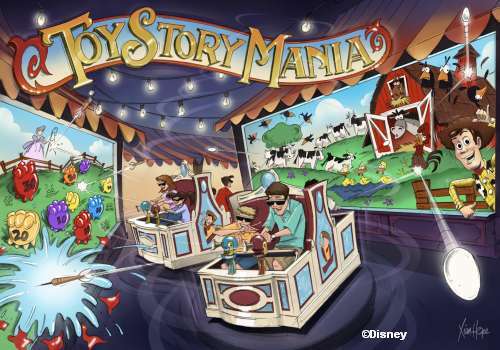 As guests score points, they will be cheered on by favorite Toy Story like Woody, Buzz Lightyear, Hamm, Bo Peep and the Little Green Men. Hidden targets give players extra points and lead to different levels of play. The attraction features games that is for all ages and skills, from beginner to serious gamer can enjoy. No matter how many times guests return to ride and play, they can be sure every ride will be different. Players pair up and sit side-by-side for a friendly competition that delivers an ever-changing variety of targets and surprises.